Portland, Maine is one of our favorite local places to visit, and while we certainly love being here in summer, winter is great too (if much colder), with fewer tourists, lower hotel prices but just as much delicious seafood. We’ve had this weekend in Portland planned for several months, our Xmas gift to each other, and we have been anticipating what we’d eat once we got here for almost as long. There are some old favorites that we always have to return to, but the Portland dining scene has been exploding for several years now, with so many new choices opening that it’s impossible to try them all. We started off our weekend with a new favorite, Eventide Oyster Company, only open a couple of years now but feels like it should have been here forever, so perfect is the food, service and atmosphere. 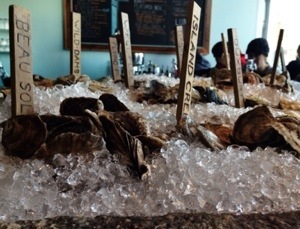 They specialize in–you guessed it–oysters, as many as they can find from Maine, with a few “away” oysters as well. 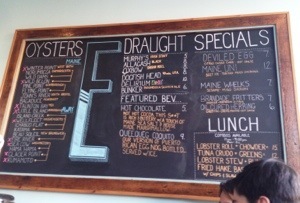 The chalkboard menu tells you what’s available today. Island Creeks (MA) and Beau Soleil (New Brunswick). Other than the Island Creek we’d had none of the varieties before, which is one of the great things about Eventide. All orders get a choice of two accompaniments, and along with the usual cocktail sauce and mignonette, choices include a creative selection of ices, such as horseradish, Tabasco, and pickled red onion (delicious). 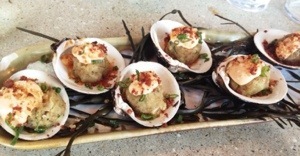 Besides oysters, Eventide has a selection of cold & hot seafood dishes as well. As we were planning to graze through our evening, we kept it light with an appetizer of stuffed mahogany clams and a side of coleslaw (easily the best I have ever tasted). They also have a good selection of local beers, including one of Rob’s favorites, MBC Peeper Ale. 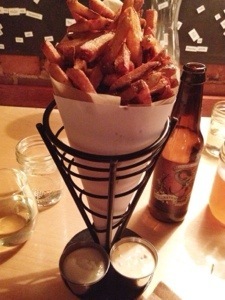 Our second stop was Duckfat, for their decadent french fries cooked in, yes, duck fat. ‘Nuf said. Dipping sauce selections abound, we went with two: aioli and Thai chili mayo. After those fries, we needed a walk, and decided to check out a new brewery/distillery on the waterfront called In’finiti. The minute you walk in you know where you are because of the smell of wort (home brewers must love this place!). The beer selection is not huge but quite interesting, and Rob enjoyed a Headstash IPA, another local brew he had never tried before. I was able to get an excellent wine too, so it was a good stop. 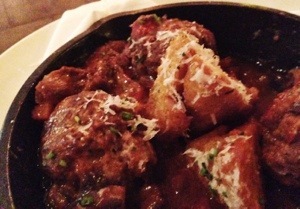 We finished up the evening at Vignola Cinque Terre, a comfortable Italian restaurant with great food and a casual atmos. 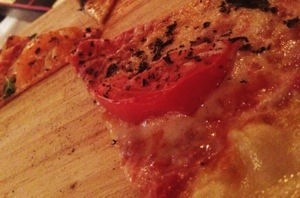 Tuscan meatball app and their signature pizza didn’t last long. We ambled home to bed quite satisfied, ready for what delicious treats tomorrow will bring.